Centella asiatica L. Urban (Umbelliferea) locally known as ‘Pegaga’ is a type of herbal plant that had been used in traditional medicine in Asia for many centuries. This species has high medicinal value derived from the phenolic and flavonoid compounds. 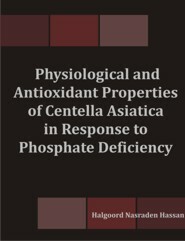 This research was conducted to understand the physiological and antioxidant properties of Centella asiatica L. Urban in response to different phosphate concentrations. Experiment was arranged in a Completely Randomized Design (CRD) consisted of five treatments with three replications. The treatments was 0, 0.05, 0.1, 0.15, and 0.2 g of Phosphorus pentoxide (P2O5 )/kg. The results of physical characteristics of Centella asiatica showed that P2O5 fertilizer significantly increased the fresh and dry weight of plants at p <0.05. The highest production of dry weight was 0.44±0.15 g for plant supplied with 0.1g P2O5. While the lowest dry weight was recorded for plants that were not supplied with phosphate, which was 0.18 ±0.05 g . Accordingly, the highest production of fresh weight was 1.71±0.61 g for 0.1g P2O5 treatment, and the lowest was 0.82±0.06 g for non-treated plants. Results also showed that P2O5 fertilizer significantly affects total flavonoid and total phenolic content of Centella asiatica. The flavonoid constituents detected was 43.7±4.6 mg quercetin equivalents /100g DW) for non-treated plants and 28.9± 0.8 mg quercetin equivalents/100g DW) for 0.1g P2O5 treated plants. The total phenolic was (5.91±0.38 g gallic acid equivalents /100g DW) for non-treated and 4.05±0.61 g gallic acid equivalents /100g DW) for 0.2 g P2O5 plants. Phosphate in plant tissues has strong positive linear correlation phosphate fertilizer. Results show that different concentrations of phosphate affects the physiological and biochemical properties of plants. Halgoord Nasraden Hassan is the head of the horticulture department in Kalar Technical Institute - Sulaimani Polytechnic University.